TCI Intern 2014 Alex Córdova (3rd from left) and our new 2015 intern Rebecca Chew (extreme left) met on a SMART project in South Africa. Soon Rebecca will be continuing the work Alex started while at TCi. The Tata-Cornell Agriculture and Nutrition Initiative (TCi) prides itself on being an interdisciplinary and innovative organization that draws experts and skills from across Cornell’s research areas to address food insecurity and malnutrition. The research group includes a multitude of individuals with interests ranging from agricultural economics, nutrition, animal science, and climate change mitigation and livelihood resilience. In order to pursue their mission, TCi implements an interdisciplinary approach and methodology pulling together a cross-functional team during the summer internship program. Alex Córdova, who received his MPA in May 2015, was a summer intern during 2014. Having an extensive background in the non-profit food security sector in the United States, he pursed non-profit management as a concentration at CIPA, but also was deeply interested in learning further about international agriculture. This led him to gain valuable experience with TCi, and to participate on a Student Multidisciplinary Applied Research Team (SMART), part of the Cornell International Institute for Food, Agriculture, and Development (CIIFAD). This team was primarily focused on water and soil management in rural KwaZulu-Natal, South Africa and utilized a participatory approach. Focused on the inter-disciplinary implementation of projects, the team comprised both undergraduates and graduate students from multiple departments. One of the undergraduate team members was Rebecca Chew, B.S. ’15 in Chemical Engineering. Rebecca has a strong desire to apply what she has learned in the classroom to real world situations, and so became involved in several projects during her time at Cornell, including the SMART program and later the TCi Summer Internship. 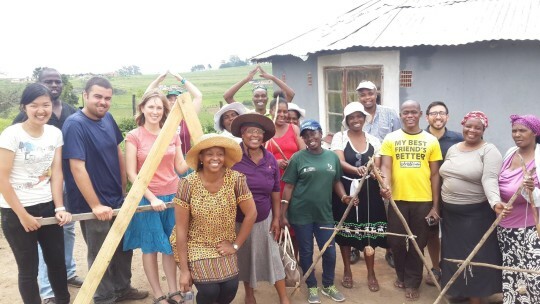 While working together in South Africa, Alex and Rebecca discussed agricultural development issues and their previous field work experiences, especially Alex’s work with TCi in the previous summer (2014). He encouraged her to apply to the TCi Summer Internship Program, and she was selected as one of five interns to work on the Minimum Nutrition Dataset for Agriculture (MNDA) in coordination with a local team at ICRISAT. Rebecca’s work this summer will be a continuation of the work Alex’s team initiated in 2014. In 2014, their goal was to design and validate a survey instrument capable of capturing the most essential dietary information at both the individual and household levels which could then be easily integrated into existing agricultural surveys (see: MNDA). One of the limitations of the data collected last year was that the team was unable to capture foods that had been consumed outside the home. Hence, this year the 2015 intern team will expand and refine the MNDA survey instrument to capture eating out behavior and the consumption of packaged foods. Rebecca’s team will also be going to the same 4 villages as Alex’s to further validate the survey tool. Data collected during Rebecca’s field work will continue to be analyzed throughout the fall and contribute to the ongoing story of TCi’s work on metrics and the MNDA, demonstrating the continuity of research across disciplines and internships.